At Cliff Kapson Consulting Ltd., we have been offering Exterior Insulation and Finish System inspections in Chicago for over 20 years. EIFS inspections test your exterior walls for multiple aspects of your exterior to assess if there are any water penetration issues that may be present. EIFS inspections test exterior walls for insulation effectiveness, water-resistance, and the appearance of the finished surface. Our inspections are conducted thoroughly while using certified inspectors who provide detailed paperwork of the inspection. If you are in need of Exterior Insulation and Finish System inspections in Chicago or anywhere in the United States for commercial and private structures, call 888-304-3437 today. You can also fill out the simple Contact Us form on the right and one of our associates will respond as soon as possible. Exterior Insulation and Finish Systems are more commonly known as synthetic stucco or Dryvit. It is used on a multitude of structures including hotels, houses, office buildings, and strip malls. Inspections are recommended by the manufacturers of EIFS regularly to help prolong the life of the material. There are two EIFS types, Barrier and Water-Managed. 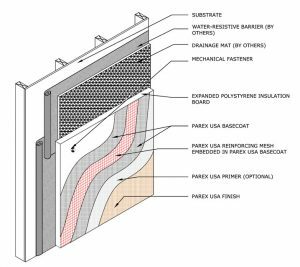 Barrier EIFS was used predominantly before the year 2000 and water-managed systems were introduced around the mid-1990s. Here at Cliff Kapson Consulting Inc., we inspect both types of Exterior Insulation and Finish Systems in Chicago and will make repair recommendations as appropriate. There are two types of inspection processes for EIFS and one is a visual inspection. The visual inspection assesses if there is possible damage or moisture penetration points around the exterior of the EIFS. The second type probes the material and takes moisture readings from underneath the surface. Both kinds of inspections should be conducted by a professional to obtain the most accurate results possible. To schedule an EIFS inspection, call the experts at Cliff Kapson Consulting Inc., today at 888-304-3437. Or simply fill out the Contact Us form on the right and we will return your inquiry shortly.